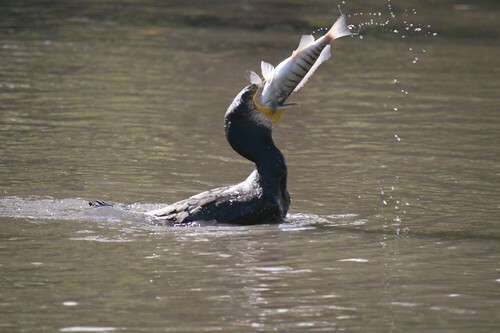 One of the most irritating predators of fish, including Koi, the Cormorant, could be the source of KHV outbreaks. This predator, along with other birds that eat fish can bring the disease to several ponds. The stool of the birds that eat infected fish may harbor the virus. Even feathers that have traces of the juices from the dead Koi fish may have the virus in them (the birds swim in the water with the dead fish). The UK based CEFAS is investigating the virus, though officials fear they may be unable to halt the virus' progress. Koi herpes virus appeared in the late 1990's. It kills over 90% of the carp it infects. The rest need to be destroyed since they become carriers for the virus and are able to infect other carp populations if they are moved to another pond.